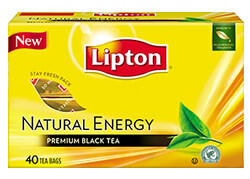 Lipton Natural Energy Tea is a black tea made from pressed, premium tea leaves. This process gives the tea a higher natural caffeine concentration. Lipton Energy Tea is designed for those who enjoy tea, but who also want a higher dose of caffeine that would be comparable to a shot of espresso. 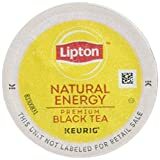 Traditional Lipton Black Tea contains about 55mg of caffeine per 8 fl.oz. serving using one tea bag. The caffeine content of Lipton Natural Energy Tea is derived by using one 2 gram tea bag steeped in 8 fl.oz. of hot water. 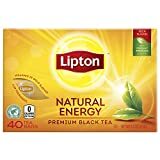 Lipton Premium Black Tea Bags, Natural Energy 40 ct "Packaging May Vary"
Orange Pekoe, and Pekoe cut black tea. 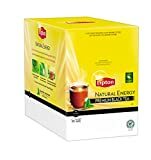 How Does Lipton Natural Energy Tea Compare? Lipton Natural Energy Tea contains 9.38 mgs of caffeine per fluid ounce (31.70mg/100 ml).